Leighton Town’s 2015 got off to a stuttering start after defeat on New Year’s Day was followed up by a postponement. Heavy rainfall prior to Saturday’s game with Marlow left the Bell Close pitch unplayable, as deemed by the referee’s pitch inspection. It means Town had a little longer to wait than expected to bounce back from their narrow 1-0 defeat to Chalfont St Peter on New Year’s Day. Kick off for that game too was delayed, but bizarrely it was because one of the officials had been struck down ill, and a replacement needed to be sought out. Eventually, the match got underway but it was the home side which nearly took the lead after just two minutes, but Daniel Ailey blasted over the bar from close range. Back came Leighton though, and Phil Draycott was unlucky to see hit well-struck free kick cleared off the line by Liam Fowler. Ailey had a clear run through Leighton’s defence on the half hour mark but his shot was off target, going wide of the post. 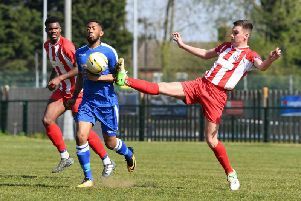 Chalfont, who started the day ninth in Division 1 Central, would take the lead just before half time though, courtesy of a huge slice of luck. Glenn Yala’s ball into the mixer took a cruel deflection off Town defender Gary Ridgway, beating keeper Dan Green all ends up and sending Chalfont into the lead seven minutes before the interval. Leighton made their first substitution at half time bringing off Billy Lobjoit for Paul Lyon. A good strike by Remmel Clarke saw keeper Green have to make the first real save of the game in the 55th minute. A second substitution for Leighton saw Warren Garcia replaced with Ash Farmer. And his impact was almost immediate, as he played a fabulous low cross to Danny Watson but he rushed his shot and the ball went wide. Ridgway received the only yellow card of the game in the 72nd minute. Leighton made their third and final substitution in the 77th minute bringing on Aaron Morgan for Michael Lyon. The 84th minute saw Watson head the ball down to Leon Lobjoit, his shot was powerful but McEntegart managed to push the ball away to the feet of Fowler. The last minutes of the game saw Fowler have a free header towards goal but it went over the bar and luckily Dave Murphy cleared the ball of the line in the 90th minute to deny Chalfont of a second goal. Town remain 19th in the table, but are now cut eight points adrift of Bedford Town in 18th place and hover dangerously above the relegation zone. And they’re in for a tough night tomorrow (Tuesday) against Uxbridge at Bell Close.